Hi, welcome to my new blog! I love crafting and have recently moved into a new house which has given me lots of new crafting and upcycling opportunities. The house we moved into is a rental so we would prefer not to spend too much money decorating it with things we wouldn’t be able to take with us next time we move. 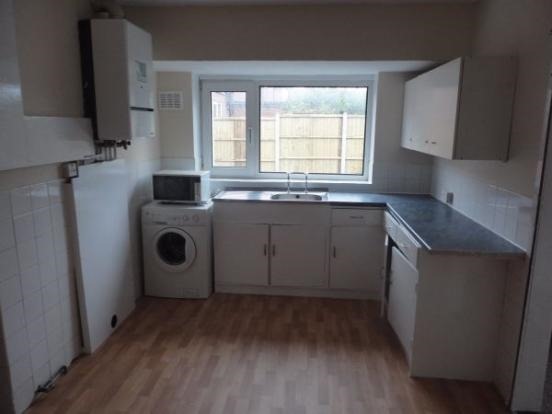 Conversely we also plan on staying here quite a while so we’d really like to make it as homely as possible. Plus I love interior design so I can’t help it! By the way, “we” is my boyfriend R and I . However let’s face it, this is not the most attractive of items! I do love the mid-century feel of it that seems to fit with the kitchen style though. I also have lots of lime green kitchen cookware and accessories and I’d seen a brochure for glossy spray paint. 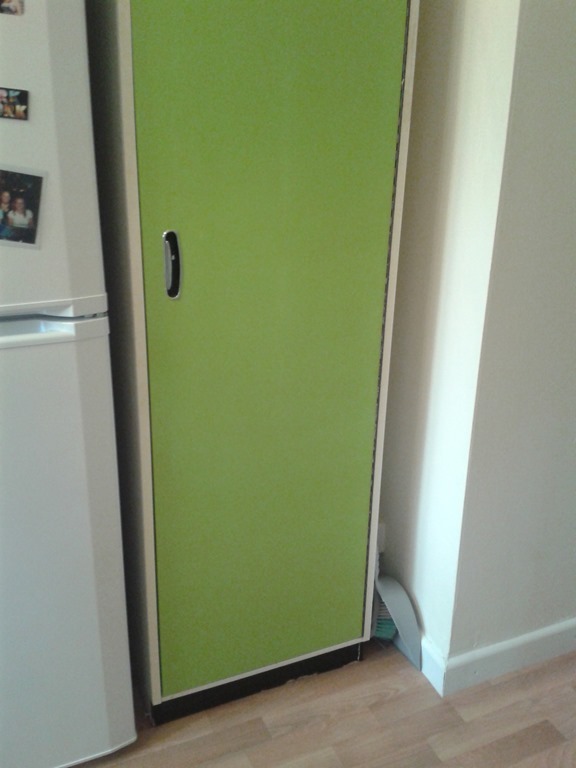 Putting those two things together and I thought if I spray painted the doors and removed the shelves from the inside, it would make the perfect hiding place for my hoover and things! So off came the doors! 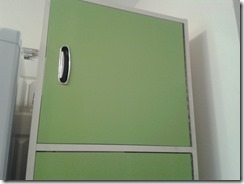 (These were put on with old-fashioned hinges that were the full length of each door – many many screws!) We lightly sanded the surface and covered the handles in masking tape. 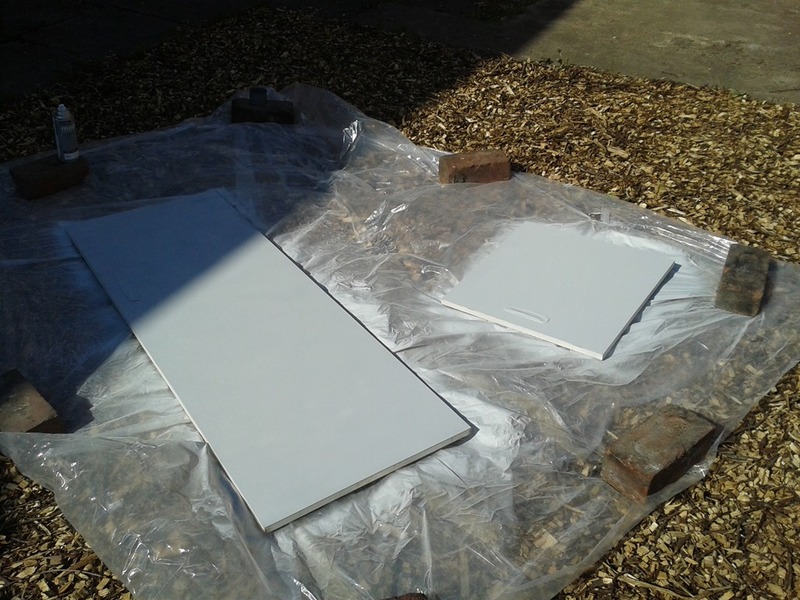 Then we sprayed the doors with Rust-Oleum Mode Primer grey filler spray paint. 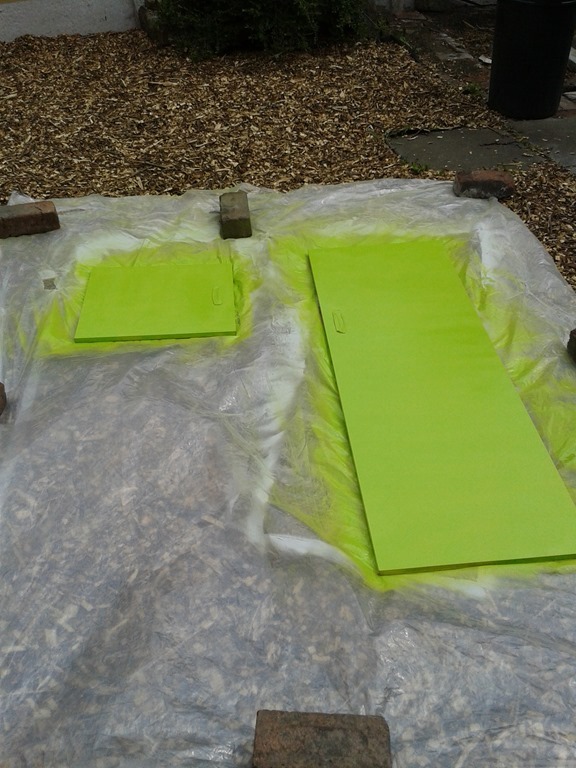 This gave a good surface for the next stage – the lime green gloss! We ended up using two cans of the Rust-Oleum Mode Lime Green Gloss as we struggled to get the finish properly glossy. As first-time spray painters we weren’t sure whether that was because we didn’t have the right technique or we were trying to spray too thinly. However we managed to get a good finish in the end. Next we removed the shelves (also easier said than done due to a great many screws in the shelf fixings) and nailed three cheap wooden slats across the back to stabilise it. Finally I screwed some hooks into some of the holes left by the shelf brackets to hang things like my bag-of-bags (everyone has one of those right?!) and dustpan and brush. It does look a bit brighter green in the flesh and I absolutely love it! Our first piece of furniture up-cycling! Hope this has inspired you to have a go. 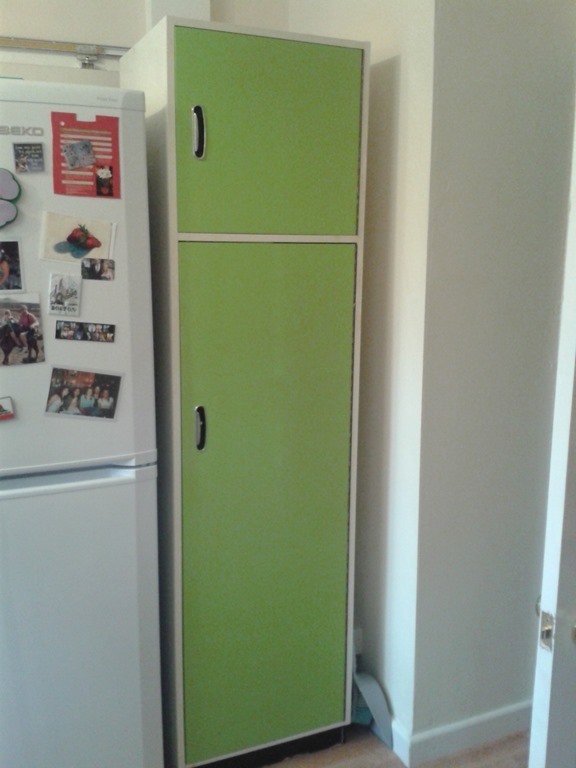 The whole thing including cabinet, delivery from Lancashire to Yorkshire and spray paint cost approximately £70 and was the only thing I could find that perfectly fitted my needs – with a bit of inspiration and TLC that is! As usual I have several craft projects on the go at the moment so I best get back to them. I will post on my progress next week! Awesome start to your blog!! I can’t wait to see what else you post. That color is perfect for a kitchen. Having a whole new space to decorate must be heavenly. Keep up the great work!